It is no secret, things are really tough at the moment. South Africa is in a technical recession and consumer spending is at an alltime low. To many small businesses this means that the pressure is very real. As a result, cost cutting will inevitably have to follow. The reality is, that legal services are often one of those aspects left unattended and would be affected most by cost cutting. Besides this harsh reality, the cost of reliable legal solutions has meant these have been out of reach for many SMEs and start-ups. As a result, many businesses have resorted to using free templates from unreliable sources and where reliable templates are obtained - they are often incorrectly utilised or completed, which renders them completely useless. The SchoemanLaw SME Self-Service DeskTM aims to address this fundamental problem and fill the gap by providing an affordable and reliable professional solution to start-ups and SMEs. The pioneering online platform hosts a range of standard legal documents forming the cornerstones of best practice. Users are allowed access to personalised support in case of any unforeseen legal incident occurring. The first solution of its kind in South Africa, the platform supports entrepreneurs to effectively establish legal foundations in their businesses for optimum growth and overall business success. SchoemanLaw was honoured earlier this year as a Finalist in the Nedbank Business Accelerator Programme and was the winner of the Gender Mainstreaming Awards for Women Empowerment in the Workplace 2018 (category unlisted Companies). 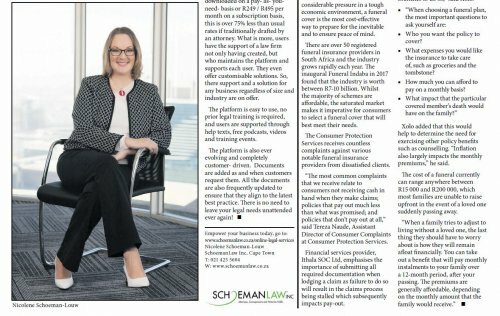 SchoemanLaw was recognised due to the platform's unique ability to provide access to trusted legal resources that empowers entrepreneurs and to create sustainable businesses that are scalable. The platform further addresses the need of effective management of individual needs, such as drafting your will, the management of crucial relationships in business, including employment relationships and contractors, as well as stakeholder relationships in the ecosystem, such as clients, debtors, shareholders, directors and joint ventures. BBBEE Affidavits (EME and generic QSE) and many more! Prices range from R195 and R895 per document if downloaded on a pay- as- youneed- basis or R249 / R495 per month on a subscription basis, this is over 75% less than usual rates if traditionally drafted by an attorney. What is more, users have the support of a law firm not only having created, but who maintains the platform and supports each user. They even offer customisable solutions. So, there support and a solution for any business regardless of size and industry are on offer. The platform is easy to use, no prior legal training is required, and users are supported through help texts, free podcasts, videos and training events. The platform is also ever evolving and completely customer- driven. Documents are added as and when customers request them. All the documents are also frequently updated to ensure that they align to the latest best practice. There is no need to leave your legal needs unattended ever again!